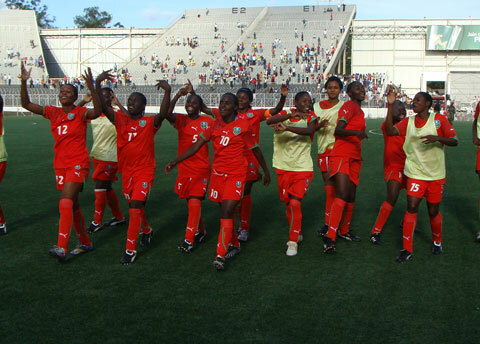 The Malawi National Women’s football team made its international debut during the 2002 Cosafa Women Championship in Zimbabwe where the team had little success where they were eliminated in the group stages. In 2003 the team made its African Women Championship debut but lost in the first round of the 2004 qualifiers losing 9-0 on aggregate. The team then took a break from international scene and went into development only to bounce back in the 2006 for the Cosafa Women Championship in Lusaka Zambia. They lost 3-0 to South Africa and Angola and beat Lesotho by the same margin. The team failed to participate in the 2008 Cosafa in Angola as the3 National Women Football Committee opted to use the available funds for the FAM Cup as a result of lack of sponsorship for tournaments. The team then made a comeback in 2011 and participated in the Cosafa Cup in Zimbabwe where they beat Lesotho 5-2, lost to Zimbabwe 8-2 and drew 1-1 with Mozambique in the group stages and qualify for the semifinals for the first time. They lost 5-1 to South Africa in the semifinals and 3-1 to Tanzania in the match for third place. In 2012 the team made a second appearance in the CAF African Women Championship Qualifiers losing 9-4 on aggregate. After a long break the team bounced back in action in 2015 playing a friendly match against Tanzania on 11th November 2015 losing 2-0.